When you live a moment of your life that is very important, you think that you will never forget it. The emotions that vibrate in that very moment are so intense that it is hard to believe that they will disappear "as teardrops in the rain". I lately realized that I remember what happened to me, but sometimes the episodes of my life are grayscale snapshots of facts. The emotions associated with the facts are gone. I hope that this blog will help me to store my memories somewhere, before time takes them away. I have always dreamt to be a scientist. Today this definition sound silly to me... I am just an engineer. But "scientist" is the word I was using when I was 7 years old and I used to spend my afternoon watching TV and Japanese cartoons. When you are a kid, people ask you about the profession that you want to take when you growth up. Football player, fire fighter, astronaut, singer? My answer was: " a scientist that builds robots". When you are a kid, the only idea of robot that you have is humanoid robots. Well, 23 years later, this is what I do: I build robots. Everything comes with a price... but I will talk about that in the future. When I became a boy, adults started to tells me that robots are (were) just science fiction and that what I really wanted to be is an engineer. Ok, I thought I will be an engineer, but I will build robots. But when I landed at the University Politecnico of Turin, the only robots around were industrial manipulators building cars in the production line... kind of boring. When I try to determine the beginning of the "domino effect" that changed my life, the first date that I can remember is August 2001. That summer, I packed my luggage and I took a flight from Turin (Italy) to Goteborg (Sweden). The years before I had been studying at Polytechnic of Turin with little enthusiasm; but in 2001/2002 I was supposed to spend a whole academic year at Chalmers, Sweden. I will not tell you about what was for sure the best year of my life, since it has little to do with robotics. What is relevant for this blog is that I joined the Master In Complex Adaptive Systems, an International Master Program related with dynamic systems, artificial intelligence and some robotics. For the first time in a long time I started to have fun studying engineering and I have got more and more motivated. I realized the importance of hard work when you want to achieve a result and that lesson was going to be very useful in the future. So, the idea was that: to design from scratch two different humanoid robots (about 40 cm and 60 cm of height), build them and make them perform something related to football in less than 4 months. 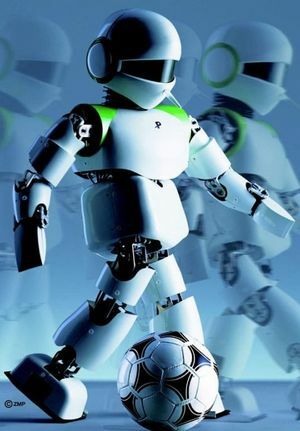 Of course, without any previous knowledge about robotics. And then... we would all fly to Fukuoka, Japan, to participate to Robocup in the newly launched "humanoid league". 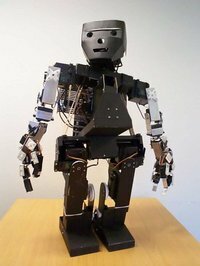 I was supposed to write the software to make walk the robots.I must confess that I realized later that my effort to accomplish this task was poor (anyway, the hardware platform have never been really able to walk). Our teacher, Peter Nordin, told us that he was looking for some sponsor to pay our trip to Japan, but he was having little luck. What happened was quite expected: people worked very hard until the very last day, but the small humanoids were not able to move. Who would do such a thing? I believe very few people. Consider, as well, that this was the ONLY year in which the students of the Complex Adaptive System (my Master) tried to participate to Robocup. The probability that something like that might happens are very low, but this event was determinant for my story and my life. The took the flight for Japan at the end of June. It was as well the end of my academic year in Sweden and I remember the precise moment in which I realized that a chapter of my life (the best one so far) was closing and a new one was going to start soon. This is Elvis, one of the two unlucky robots.